Solids: When Will a Baby Master Eating From the Spoon? This post is in reference to using a spoon when you are first starting solids, somewhere around 4-6 months. Babywise says it takes three days to master using a spoon. Brayden had it mastered the moment it hit his tongue. He was obsessed with food and had studied us eating. Kaitlyn took longer. It took her until she had been eating three times a day for three days before she finally started to improve her spoon eating skills, so that was at least a week and a half of eating from a spoon total. That was just improvement, not mastering. She took some time there. So once again, as far as a spoon goes, it really depends on the child. I found that how good Kaitlyn was with a spoon greatly depended on how hungry she was. Breakfast was not her cleanest time because I had a lot more milk in the morning so she wasn’t that hungry. At dinner she seemed to be starving and inhaled both the food without problem or mess. As in all things, it will come. Solids: What do they eat at each meal? Solids: When Do They Master the Spoon? 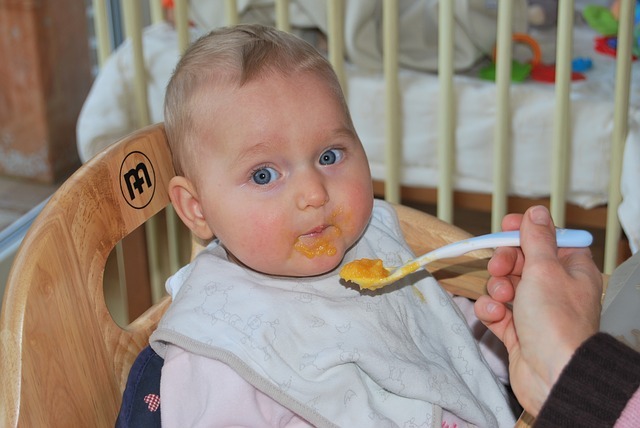 Solids: When Do You Stop Babyfood and Move to “Real” Food?